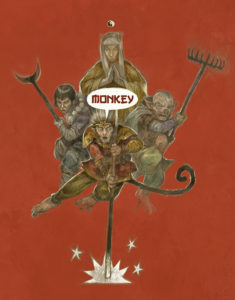 23 Days of Monkey, Day 4 Tripitaka | Monkey Magic! 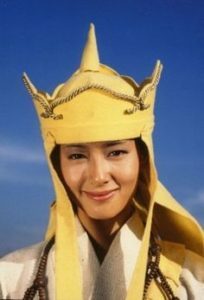 One of first questions I get asked about Monkey from people who know it from the 1980s Japanese TV Series, which was shown over here in the UK over the tea time slot on BBC2, is “Was Tripitaka a girl?” to which I’ve learnt to smile and answer back “No, he was bloke in his late twenties who’d lived a little”. While in the Japanese TV version the casting people made the decision to cast the Monk that Monkey and company are escorting to India as a young androgynous woman, in the book Tripitaka is a man in his twenties who’s got his own back story as deep as Monkey’s. In short there were shenanigans in his family and he ended up joining a Buddhist monastery early in his life. While he was away his father is killed by bandits, at the command of the man who forces his mother to marry him. This bandit who becomes a noble forbids her from contacting Tripitaka.Later in life the Tripitaka, who has grown up to be the wise Abbott of his monastery, takes a sabbatical to find out what has happened to his parents, rightly worried that he hasn’t heard from either of them over the years. He uncovers his bandit stepfather’s plot and the Emperor gets involved and the villain is trapped and quickly executed. This is one of the things that leads to the Emperor realising that all is not well in China, that wickedness prospers and that if only the Chinese Buddhists had not only the Lesser Vehicle of Buddhism, that emphasizes the enlightenment of the individual, but also the teachings of the Greater Vehicle, which teaches compassion for all living things and strives to attain the status of a Bodhisattva, a person who has achieved Enlightenment but has delayed entry into Nirvana to help others attain salvation. The name “vehicles” implies the journey that a follower takes towards enlightenment, and the Greater and Lesser Vehicles reflects the teachings of the two schools that formed after the historical Buddha’s death from his original disciples. Tripitaka because of his recent adventures, while easily frightened and in many ways naive because of his sheltered life in the monastery, is chosen to lead the mission to India by the Emperor because of his virtue and scholarly knowledge. So he sets off into the dangerous road with his two assistants. 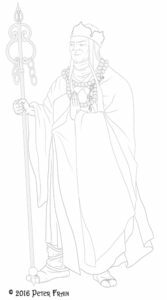 The Two assistants perish early on, so Kuan Yin the Buddhist Goddess of Mercy puts him in touch with the three fallen Immortals. He encounters and frees Monkey the his mountain, where hes been put there Great Buddha for running amok in the Western Heaven, Pigsy and Sandy , book an ex-Marshall of Heaven banished to Earth by the Jade Emperor (the heavenly counterpart to the Earthly Chinese Emperor). She also puts Tripitka in touch with the disgraced son of a Dragon King, who after a fight with Monkey, Pigsy and Sandy (who initially take the traditional adventurer approach of “Fight first, ask questions later when we can’t beat it”) , who takes the form of a horse to carry the Monk to India. 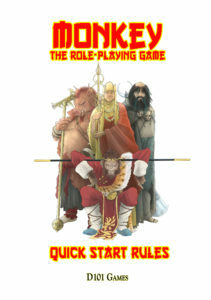 Part of the new rules in 2nd Incarnation is quick rules for creating the Monk that the characters are escorting to India, in their own Journey to the West, The idea being that like Tripitka in the book, their Monk should be a fundamental supporting character who helps, and occasionally hinders, the player Immortal’s Journey West. 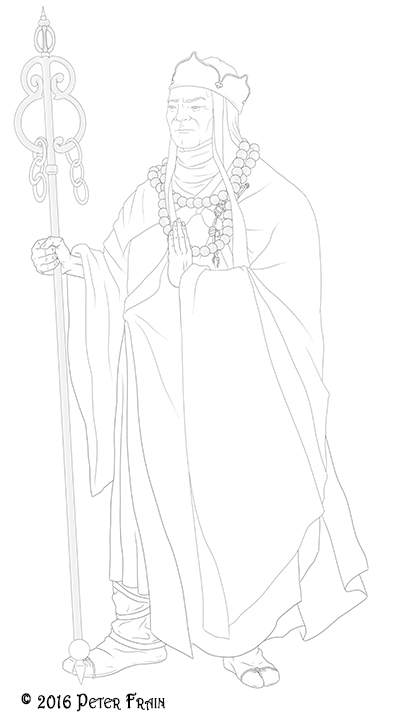 Here’s Tripitaka as he appears in the game. Buddhist Priest 3, Scholar 2, Courtesan 1. Weakness: Fearful. Tripitaka is constantly being afraid and reduced to a blubbering mess of tears when the Pilgrims encounter demons and the supernatural perils of their journey. Headache Sutra – this can be used to directly control Monkey by causing the golden headband that he wears to constrict. Other Sutra’s – Tripitaka can also cast sutra’s (or magical spells) which being a Buddhist tend to revolve around driving off demons. Magical Dragon Horse – Tripitaka rides a solid and dependable horse who is a transformed Dragon Prince (who unfortunately cannot transform back until he’s helped Tripaka get to India). Worth mentioning , and showing, one of my favorite versions of Tripitaka, the Hairy Monk from Stephen’ Chow’s Journey to the West Conquering Demons, which I’ve covered before on this blog. 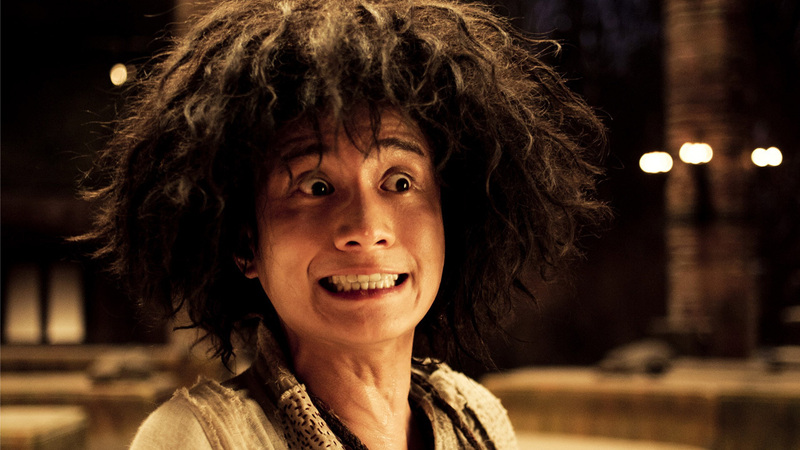 But don’t worry this scruff looses his Sideshow Bob Hairdo during the movie to become the familiar bald headed monk. The Journey to West is a mythic retelling of the real life journey of the Buddhist monk Xuanzang, who took 19 year to travel from the Tang Empire to India to collect the lost scrolls of Buddhist lore known as the “Tripitaka”. This is the first two parts of a Chinese TV series about him, there are links on You-Tube to parts 3-12 that follow, which details his epic journey to India and his impact on Chinese Buddhism and History.